What do patent filings reveal about the race to fully autonomous vehicles? We have explored various potential technological innovations in the auto industry in a previous post, but here we will look more specifically at patent filings related to self-driving cars. These patents can help provide a better understanding of the diverse challenges facing autonomous-vehicle developers. In 2015, The Guardian predicted that self-driving cars would relegate us to “permanent backseat driver” status by 2020. Four months ago, The New York Times suggested that autonomous vehicles are in fact years away. Elon Musk might beg to differ, but most transportation experts and others analyzing the field agree: You probably won’t be sitting as a completely passive passenger in a self-driving car for a long time. Ten years could even be an “optimistic assessment,” and a decades-long timeframe might be more realistic. 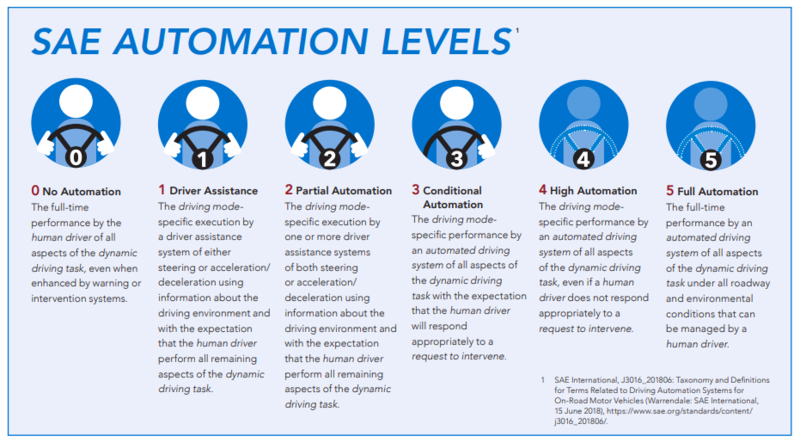 This Automation Levels graphic, based on a taxonomy developed by automotive engineering group SAE International and republished in the U.S. Department of Transportation’s 2018 report on automated vehicles, defines progressively more advanced autonomous driving systems. Automating the context-driven process of driving has proven to be an incredibly complex, difficult, and time-consuming undertaking for tech and car companies alike. Do autonomous-vehicle innovations point to additional challenges besides the five listed above? Another issue that semi-autonomous vehicle designers face is adjusting driver attention according to the challenges appropriate to the situation. 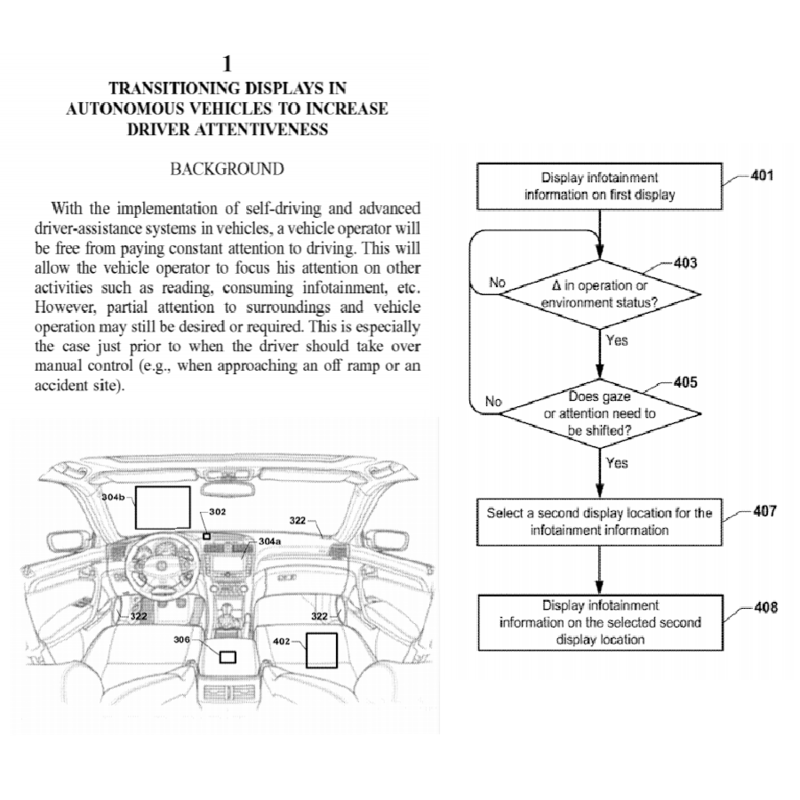 Patent US10235122, Transitioning displays in autonomous vehicles to increase driver attentiveness, proposes a system for changing the display of infotainment on various screens in a car based on whether the driver’s gaze or attention needs to be shifted. Alerting drivers to potential distractors — or eliminating those distractions altogether — is a problem that must be addressed for the current state of self-driving cars since they all still require human input or supervision. So while this isn’t directly related to fully autonomous vehicles, it’s a necessary challenge to solve in order for semi-autonomous vehicles to get there. Cadillac, for example, already uses an infrared camera in their Super Cruise system to issue warnings when a driver’s head position changes in a way that suggests they are looking away from the road for an unsafe period of time. What patent filings offer possible solutions to these issues? 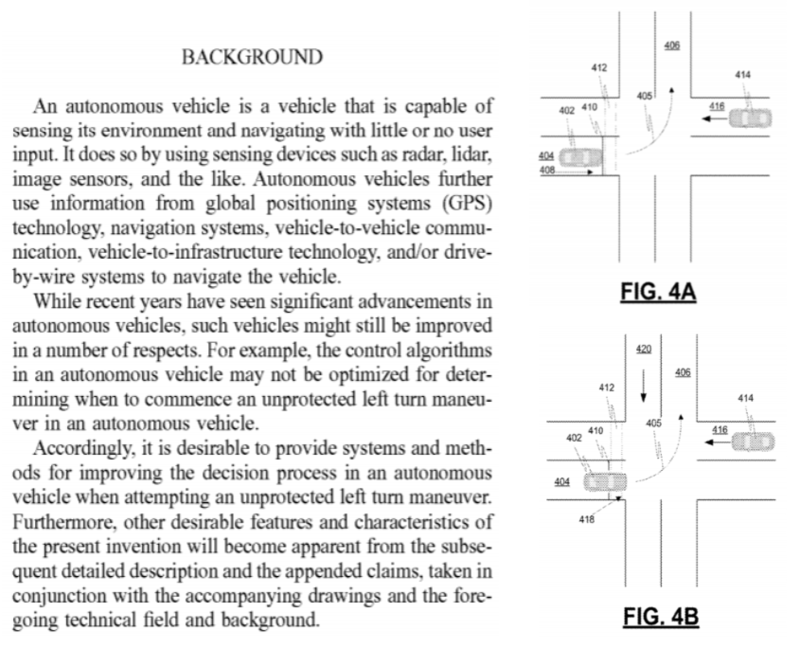 Patent US9720412, Modifying the behavior of an autonomous vehicle using context based parameter switching, describes a system of sensors that determine the environment a vehicle is operating in, and then selects parameters corresponding to those sensor results. The vehicle is then controlled in a particular autonomous mode based on those parameters. This could be used to address changing physical environments due to poor weather, suboptimal road and lane visibility, or even something as mundane as dense traffic. Source: ktMINE patent search; full text on Espacenet. This patent is held by Waymo. Sensors may seem like an obvious part of autonomous vehicle technology, but really any machine that operates through some sort of artificial intelligence system must be able to take in and interpret input parameters and adjust its output accordingly. Highly sensitive sensors and rapid logic-based decision-making programming are essential features to include in any self-driving car, especially if we want the integration of technology and human life on our roadways to be seamless and safe. After all, machines aren’t unpredictable — people are. Patent US10198002 addresses another of the five main challenges noted above: left turns. Systems and methods for unprotected left turns in high traffic situations in autonomous vehicles, currently held by GM, describes a method for determining whether or not a self-driving car should perform a left turn when in any one of a variety of situations: clear of approaching other vehicles in a stopping zone, in a “dilemma zone,” or in a cross-traffic zone. While self-driving vehicles may be years or even generations away, the burden isn’t just on car manufacturers to make this envisioned automated future a reality. We also need better roads and infrastructure. Our driving environments need to be ready to accommodate self-driving cars as well as unpredictable humans in public spaces. Planning and structuring our environments in a way that anticipates and eases the difficulties of navigating among cyclists, animals, even wind-blown debris — this will help make our world safer for both drivers and pedestrians alike, robot or not. Mcity is the result of a partnership between Ford and the University of Michigan. Mcity is a simulated urban environment on the University of Michigan’s campus developed and designed for the sole specific purpose of testing and adjusting autonomous vehicles in an environment as close to actual roadways as possible, without the danger inherent in testing autonomous vehicles in a real-world environment. Simulated driving environments like this one — and careful, scaled testing on a community-by-community basis — are a good way to promote and accelerate technological advancement while minimizing the potential cost of endangering human life. While autonomous vehicles may be a long way off from being a perfectly integrated part of our everyday lives, it’s exciting to consider the potential of this emerging technology. The more immediate impact of autonomous vehicle technology may lie in applications of this technology to particular industry areas like agriculture, emergency responses in off-road environments, or freight transportation. Our webinar on April 9th will further explore IP trends in autonomous vehicles alongside blockchain and virtual reality. Register here to learn more about how these emerging technologies can impact your business strategy.